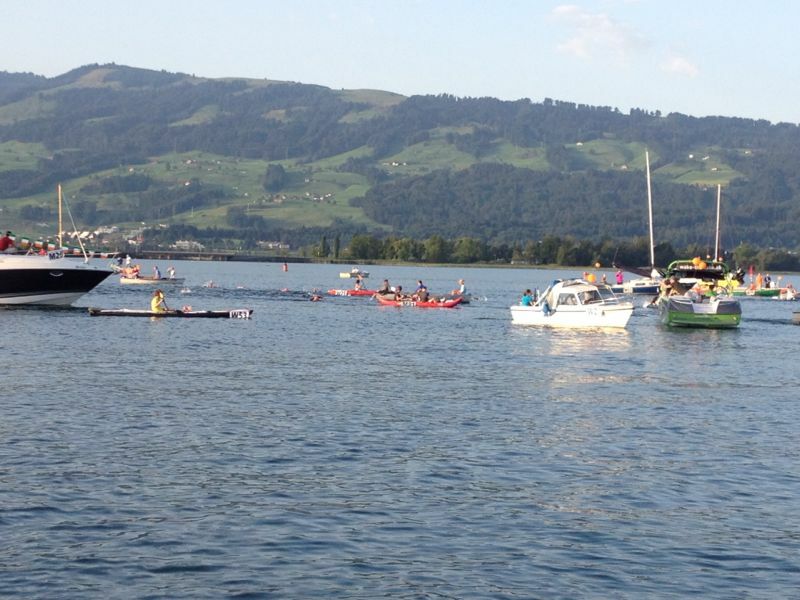 Last weekend (10th August) was the 2014 Sri Chinmoy Marathon Swim across Lake Zurich. This brought back some great memories of 2013 when Manda and I competed in the race. 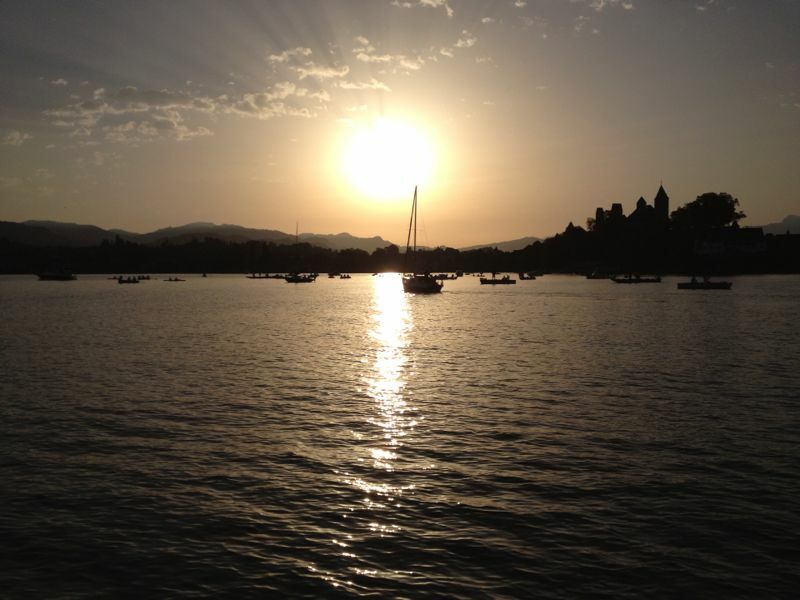 The race is a scenic 26.4k from Rapperswil to Zurich lido. You can swim it solo or in a relay (up to three people), wetsuit or non-wetsuit so there is something for everyone depending on your preference. The swim is very popular and space is limited so we applied three times before achieving our place in 2013. Given that we had been turned down twice before we didn’t hold out much hope in the third year so it was a bit of a shock when I got a text from Manda early one cold December morning to say we had got a place. At that point I had been struggling with a shoulder injury and had been out of training completely for 8 weeks so the thought of the race was pretty daunting. We slowly built up the training again and soon we were back to doing long sets. In the winter we mainly do our weekend training at Crystal Palace often sharing a lane with Lucinda Bayliss and co. They frequently put us to shame by knocking out 20km sets. It makes our 8 – 10k sets look a bit puny! When I was an age grouper I used to swim at Crystal Place 2 – 3 times a week with my club Leander SC so it always brings back old memories training there. 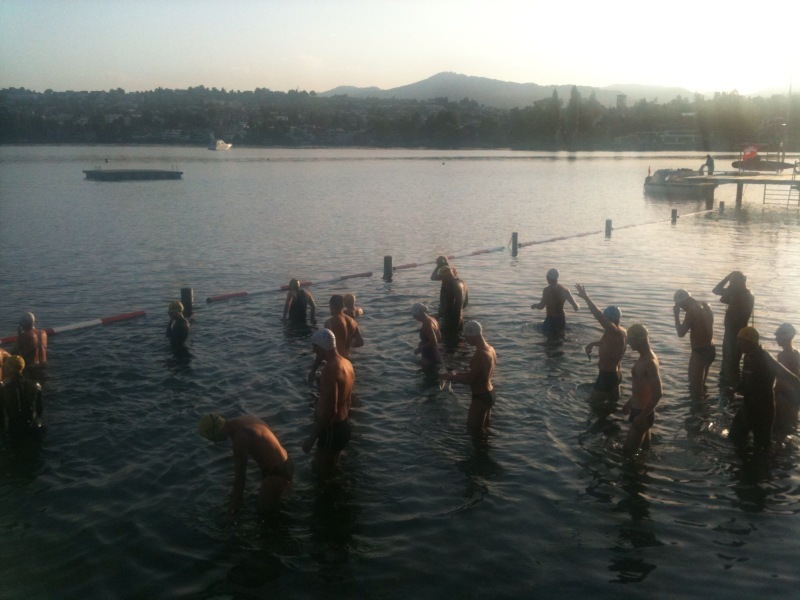 We also attended two intensive weekend training camps with Dan Bullock of Swim for Tri. These included plenty of time in the water, technique coaching and dry land work. Vicky, Dan’s fiancé and semi-pro triathlete, took us through her daily core routine – we all collapsed after about 30 seconds! As the weather and the water gets warmer we moved outside splitting our training time between Tooting Bec Lido, Bray Lake and Shepperton Lake. This means a lot of early starts (Manda always jokes that she makes me get up earlier at the weekend that I have to do during the week) and a lot of shivering from the cold! Our final bit of ‘training’ was going on a Strel Swimming Adventure to Slovenia with the other Mermaids and our friends Lisa and Paul. The trip was amazing and Slovenia is beautiful. The actual day of the race was getting closer and we were packing and doing the last minute bits of preparation when Manda fell ill. When I met her at the airport to get our flight she looked pretty pale and I thought it would be touch and go whether we would be able to start – like a trooper though she did. On the day of the race (another early wake-up!) Manda was swimming first so she went down to the start line and I got aboard the support boat. The boat and its three sailors were very nice – unfortunately the sailors didn’t speak any English and I didn’t speak any German so communication was kept to a minimum! Manda has a degree in German and lived there for a year so she managed to chat away with them. The solo swimmers were set off and 7am and at 7.15am we were finally off. 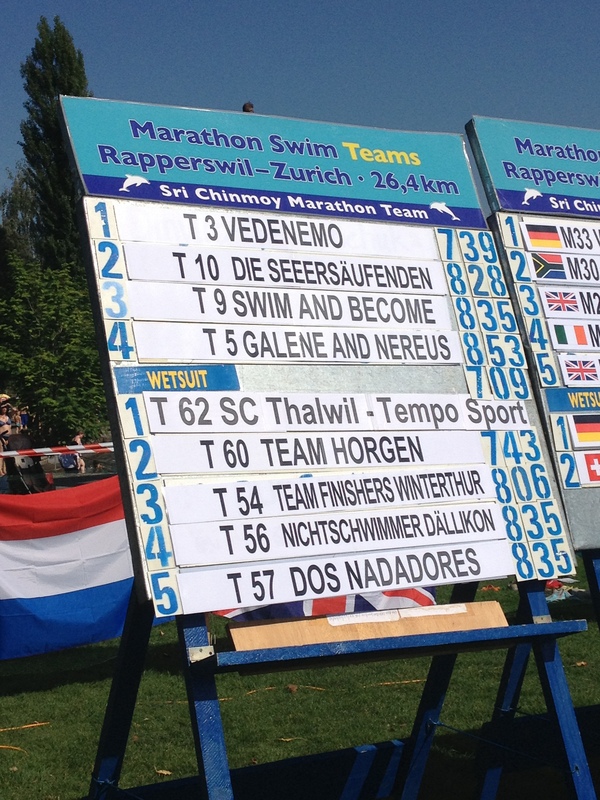 The format of the relay was is that you each swim an hour on an hour off. This meant that we didn’t actually get to speak to each other all day so we had to send each other text messages of encouragement. It wasn’t long before we started catching up with some of the solo swimmers including Shane, a friend of Manda’s and his kayaker also called Shane. Manda, who was swimming at the time, stopped to have a chat. Now knowing Manda, once she has started chatting we could be here all day so I yelled at her very sternly to keep going! I’m not sure she has forgiven me. The weather at the start of the day was absolutely beautiful, hot and sunny and the water was lovely and warm. When Manda was in for her third hour, however, a storm picked up and continued when I got in for my third hour. This made the water very choppy and this was definitely the toughest part of the swim. Towards the end of my hour, however, it cleared up and the sunshine returned. 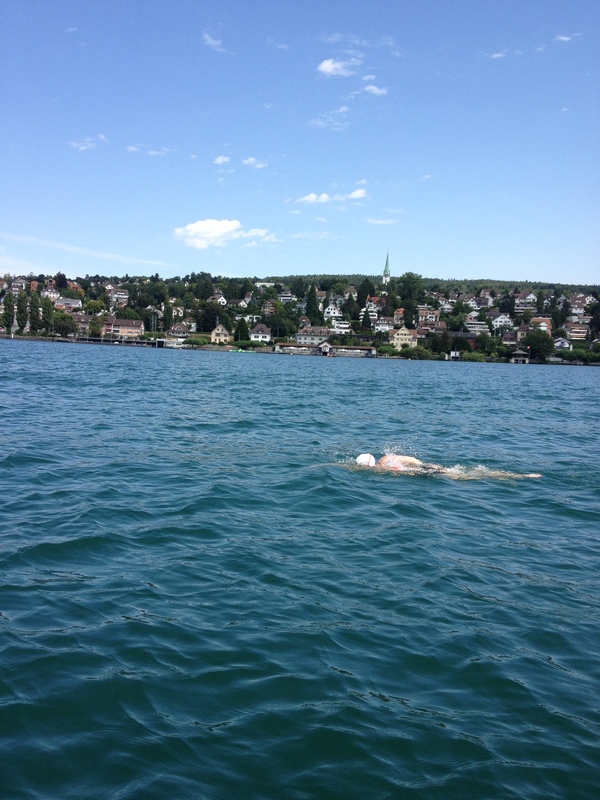 With Manda back in the water we were getting closer and closer to Zurich Lido. During her 4th hour Manda had some competition from another swimmer and they swam neck and neck for a while. 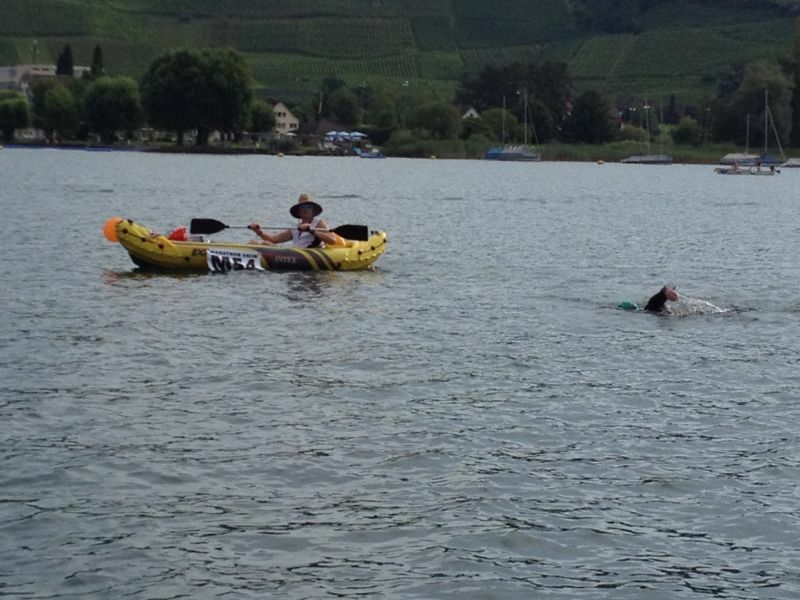 Such is the nature of the race that we didn’t know if they were a solo swimmer or another relay. By the time I got back in at the start of the fourth hour we only had about 2.5km to go before the end of the race. I put on the fastest swim I could muster but I am not going to lie after an hour of being pulled about by the storm my shoulders were killing and I definitely found it tough going. It seemed like we were getting no closer to shore but then suddenly Manda was on the side of the boat putting on her hat and goggles. 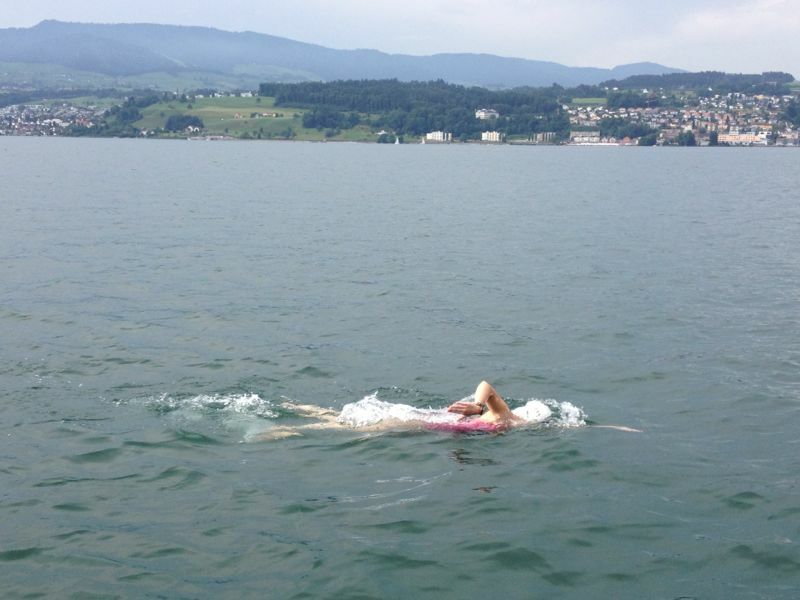 This sight filled me with relief as I knew she would only be getting in alongside me if we had less than 200m to swim. We finished the 26.4km in 7 hours and 39 minutes well ahead of our target time of 8 hours. The best news of all was that we had won our category! I think the photos below show how happy we were at this news.